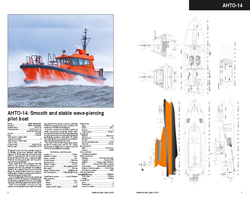 The Ship & Boat International team has started work on this year’s edition of the annual RINA journal Significant Small Ships, profiling approximately 30 new vessels sized between 5-100m and officially delivered in 2017 (with the exception of prototypes). Significant Small Ships of 2017 welcomes any submissions from naval architects, boatbuilders and designers. We cover all vessel types, including RIBs, patrol / SAR craft, crew transfer boats, tugs, ferries, yachts, workboats, OSVs, research/survey vessels, pilot boats and inland/coastal vessels, among others. We are especially on the lookout for vessels that are first in class, or that boast unique and/or special design characteristics and items of equipment. All submissions are considered and assessed on terms of merit, from the smallest to the largest within the range we cover, and multiple submissions (for instance, of three vessels produced by the same designer or yard) are allowed. Our deadline for entries is 12 December 2017. If you are interested in submitting vessels, please contact the editor, Martin Conway, at mconway@rina.org.uk or on +44(0)20 7235 4622 ext 311 and we’ll be in touch with further info and the relevant forms.